NGC 1055 is located in the constellation Cetus at RA 02h 41.8min and DEC +00d 26min at a distance of 52 million light years having a diameter of 116,000 light years, or about 7 arc min long. It is an edge-on spiral galaxy with a prominent, knotty dust lane that is home to new star formation. It was discovered by William Herschel in 1783 and is also catalogued as HI 1. It is reported to be part of a binary pair of galaxies with M77 (NGC 1068), and is a bright infrared and radio source. There is a central bulge, but this image shows several additional features. There is an extended halo around the galaxy, but the upper side (south) appears to bifurcate. The extent of the galactic plane in both directions apprear to be bent. There appears to be a faint, darker dust lane extending underneath the main rim toward the top (east). All in all, a fascinating structure.. 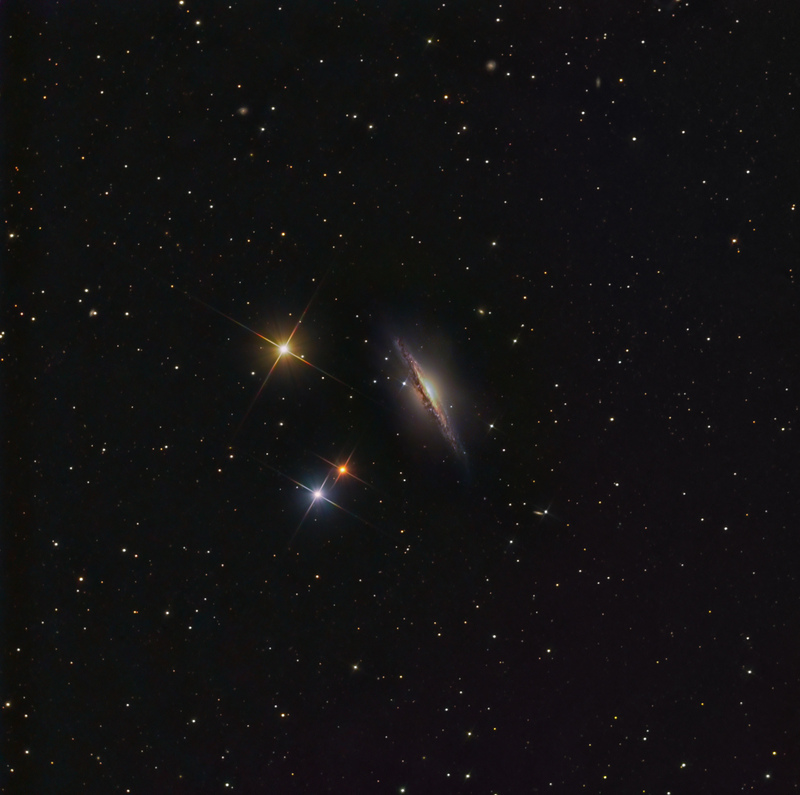 There are several mag 17 catalogued PGC galaxies to the upper right and lower right of NGC 1055.